If you’ve asked a kid recently what his or her favorite food is, the likelihood of pizza or hamburgers being the response is fairly high. But if you probed a bit expecting some thought about food coming from their own house — food that didn’t come from a box, frozen package, or needing to be microwaved, it could be a different story. Macaroni and cheese may be mentioned, and perhaps tacos or spaghetti — unless the kid is like my youngest who surprised me when he was about eight with “mussels and clams in white wine sauce” after trying them at a restaurant in Monterey. The chance of cabbage rolls topping his or any kid’s list is slim to none, yet they were one of my favorites. Maybe it was the tomatoes. When I think about it, tomatoes factored into most of my favorite childhood dishes: spaghetti, goolash (I’ll save that one for another day), stuffed bell peppers — yes, and pizza. I love tomatoes in just about any form, so you can imagine my horror when I discovered other cabbage roll lovers enjoyed theirs prepared with sauerkraut. I do like sauerkraut, because it is cabbage, and cabbage plays a pretty important role in, well, cabbage rolls. But my palate suggests sauerkraut belongs on my favorite kind of hot dog — one that’s loaded with mustard, lots of onions, chili with beans, and a dollop of sauerkraut. Bear in mind there should be so much of that tasty combo of flavors, the actual dog has to be difficult to find under it all or it hasn’t been made properly. 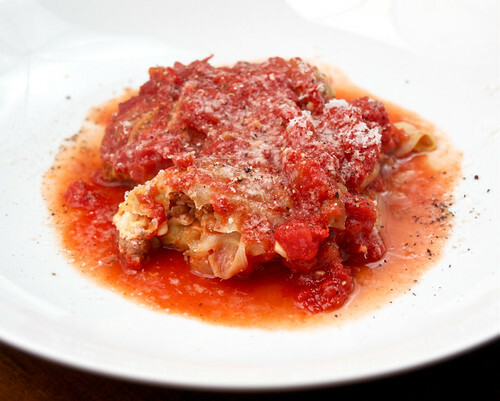 Cabbage rolls must be similarly slathered in tomatoes. Although my version of cabbage rolls isn’t quite like those my mother made, stuffed with ground beef and rice, it’s close enough. I’ve substituted turkey, wheat berries instead of rice, and sneaked in a bit of tangy feta. Easy on the budget, very good for your body, not a challenge to put together — especially ahead of time — get your picky eaters to help you prepare it, and who knows? You may have a convert on your hands. Prepare the tomato sauce first. In a large skillet, add the olive oil and garlic over medium heat, stirring a bit before adding the tomatoes. Add the seasonings, and bring to a simmer, stirring occasionally before lowering heat. When it thickens after about 5 minutes, remove from heat. 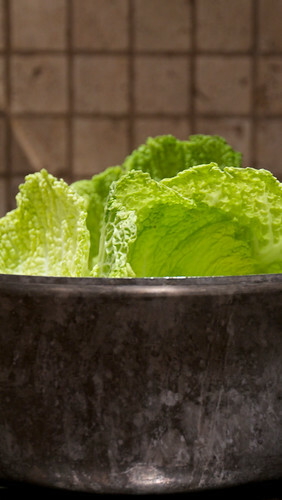 Prepare the cabbage by cutting off the stalk end and carefully cutting straight into the cabbage to remove as much of the thick white interior as possible. The goal is to free the leaves to be carefully peeled away from the head with as little tearing as possible. You’ll need 10 – 12 leaves. Once the water has begun to boil, drop the leaves into the water pressing them to submerge them. Allow them to soften in the simmering water for no more than 5 minutes. Pour them into a strainer and rinse with cold water until they’re easy to handle. Lay them out on a dish towel to dry. To prepare the filling, pour the olive oil into a skillet and add the onions, stirring until softened a bit. Add the garlic and the tomato paste, stirring to mix well. Add the turkey meat, breaking it into small pieces as it cooks, and tossing it in with the tomato onion mixture. When the turkey meat is no longer pink, pour in the wine and mix well, cooking until most of the moisture has evaporated. Add the cooked wheat berries and mix them in. Now add about half of the tomato sauce. Taste for seasoning and adjust if necessary. Remove from heat. 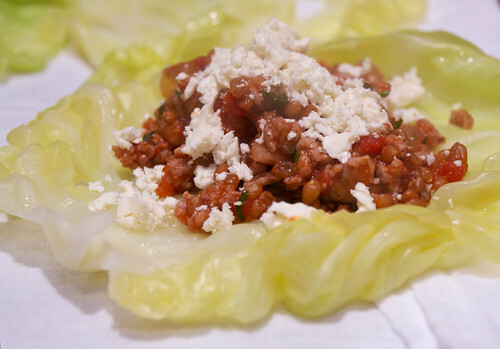 To fill the cabbage leaves, spoon 1/3 to 1/2 cup filling into each leaf, then sprinkle about 1 T of feta cheese over the filling. Beginning with the stalk end of each leaf, carefully roll the leaf over the filling, tucking in the sides as you roll. Place each filled leaf seam side down in a well oiled 9×13 casserole or lasagna pan. Pour the remaining tomato sauce over all of the cabbage rolls and cover the pan with foil. Bake in a 375 degree oven for 30-40 minutes, or until the stuffed cabbages and tomato sauce are hot and bubbling. Serve with some of the tomato sauce poured over and a grating of fresh Parmesan if desired. The biggest difference between this recipe and most others is that this filling is cooked before it goes in the cabbage leaves. There’s no egg called for to bind raw meat and other ingredients together. 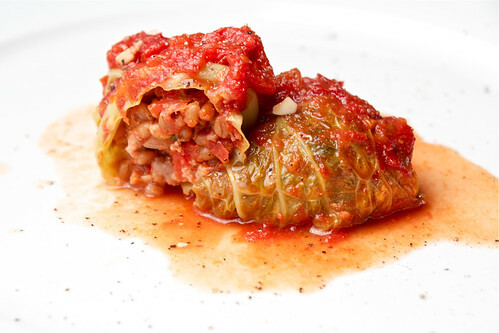 My mother used to place her cabbage rolls in a Dutch oven, pouring canned tomatoes over the top and cooking on the stove top instead of the oven — about an hour. I made half of this recipe with regular cabbage and the other with savoy cabbage. 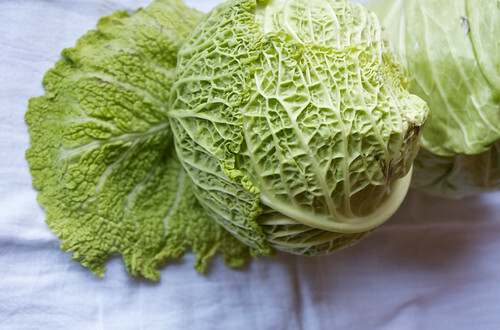 The savoy cabbage is brighter in color, easier to blanch, holds up better, and has a very nice texture in the end. My resident taste testers preferred it over the traditional cabbage used. If I could actually find a regular head of cabbage that hadn’t had all the beautiful green leaves trimmed from it, I may have a different opinion. This recipe makes quite a bit of filling. It wasn’t a problem, however, because my husband was eating it out of the pan with a big spoon while I was making the cabbage rolls. This is a fairly inexpensive and reasonably lean, healthy dinner. Here’s the run down: tomatoes are packed with the phyto-nutrient lycopene, an antioxidant whose benefit intensifies with cooking. Cabbage is a good source of vitamin C and folate among other valuable nutrients and it’s very low in calories, so great for diets and weight loss. Turkey is a more healthy alternative to ground beef — especially if it’s extra lean. I used Jenny-O which already has the Italian flavoring in it. Wheat berries are whole grains of wheat minus the hull. 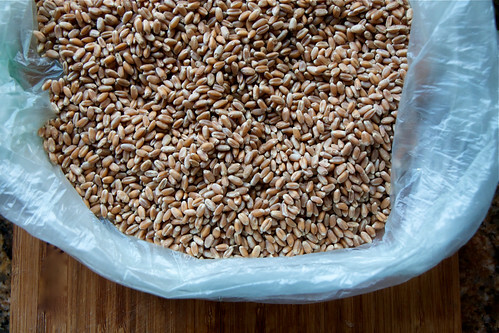 Like other whole grains, wheat berries have excellent nutritional value. That aside, they have a wonderful nutty flavor and pleasant texture. Whether they’re used in this recipe or eaten plain with a bit of seasoning, they’re good in salads, soups, or as a meat substitute in some recipes — like this one. To cook a batch of wheat berries, boil 5 c. water and pour in 2 c. wheat berries. Bring back to a boil, then simmer until the wheat berries are “al dente” about an hour. Make enough for leftovers. These are even better heated the next day in the microwave. 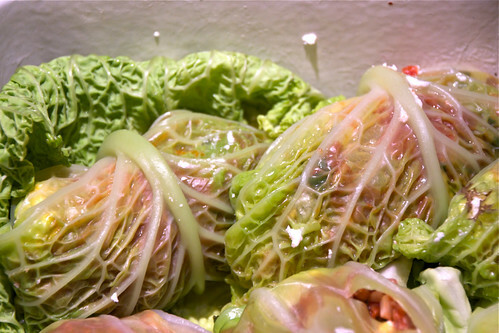 The whole pan of cabbage rolls can be constructed, covered with plastic, and put into the fridge the night before. As an alternative, make the sauce and the filling, storing them separately in covered containers. About an hour before serving time, blanch the cabbage leaves, fill them, and bake.